Wow what an inspirational day I had! 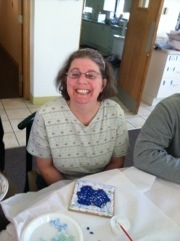 Today I got to work on stained glass mosaic tiles with a group of developmentally disabled adults. 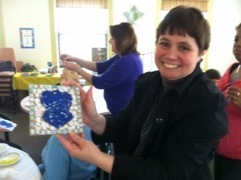 It was incredibly rewarding to share my love of crafts with a group of people who love to craft as much as I do. For me making things with my own hands gives me such a sense of pride, and it was obvious that my friends from Angels’ Place felt the same way. 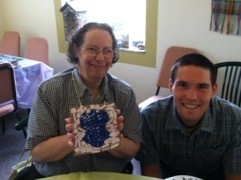 Angels’ Place provides Christian homes and Hope for persons with developmental disabilities. I can honestly say that everyone I met today truly was an ANGEL! 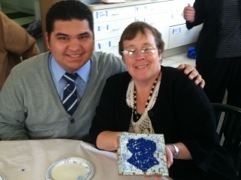 The project was to make a tile with an Angel in the center and a color background. 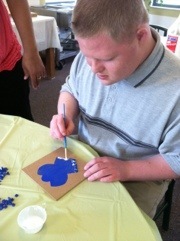 Each person had a board with an Angel painted on it. 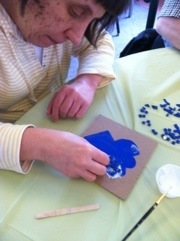 We started by painting glue on the Angel and filling her in with pieces of blue glass leaving space in between for the grout that will be added later. 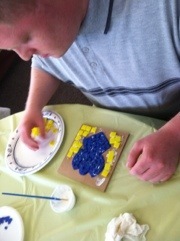 Once we finished the angel each person got to choose a tile color or colors to fill in the background. For some this was a difficult decision. It was fun to watch because 2 of the men knew right away that they wanted yellow for their background because they are fans of the University of Michigan. Another woman struggled with the mechanics of gluing the glass in place but was emphatic that she wanted a purple background! Then there were those who just couldn’t narrow it down to one color and so they opted for multi-color backgrounds. 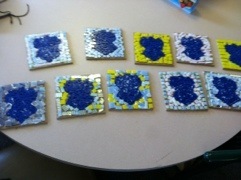 Each piece was truly unique and I can’t wait to see them once they are grouted. 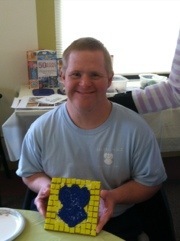 Once our works of art were completed we took pictures showing off our designs. Then we celebrated our success with juice and cookies! The highlight was when we all sang together “This little light of mine, I’m gonna let it shine.” I know I was beaming all the way home, and I hope my friends were too. This is such a great project—bless you for doing this , you are truly an “Angel” yourself. Thank you Earline. Your comments are very appreciated. The project look very dear to your heart, seeing the smiles on their faces by making something will always make them feel special. Great job!! This is so sweet. Thanks for sharing!